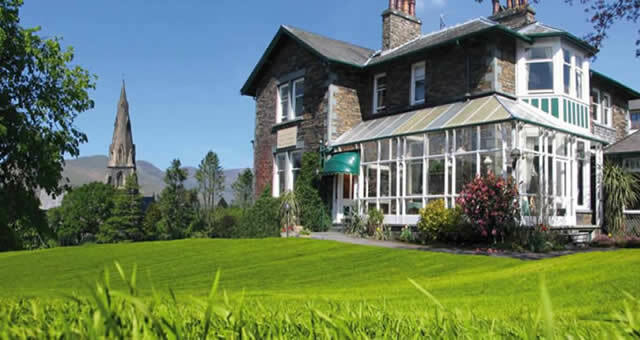 Rothay Garth015394 32217work015394 34400fax Guest AccommodationRothay Garth has a superb position combining glorious mountain views with easy access to Windermere Lake and Ambleside. Ambleside village is one of the best known and visited due to its ideal location, a perfect base at the Heart of the Lake District. Rothay Garth at Ambleside is a beautiful traditional Victorian Lakeland slate building set in its own landscaped grounds. Whilst retaining its character and many original features, Rothay Garth offers en suite rooms all with tea and coffee making facilities, colour TV and radio and hairdryer, a comfortable spacious residents lounge, conservatory looking out to superb mountain scenery, elegant breakfast room and a large private car park. There is also free Wi-Fi available in the lunge area. Here at the Rothay Garth at Ambleside we pride ourselves on our friendly and personal service. The Dixon family and staff invite you to share our wonderful heritage that is the Lake District. A warm welcome awaits. Rothay Garth sometimes limits bookings to 3 or more days. Superior double room with solid pine furniture including a king sized bed. The ensuite has a bath as well as a shower. Room 14 sometimes limits bookings to 3 or more days. Room 15 sometimes limits bookings to 3 or more days. Own private entrance with private lounge and patio. Room 18 sometimes limits bookings to 3 or more days. Clean and comfortable accommodation in a premium location, just steps from shops & restaurants. Welcoming hosts, good breakfast, and ample free off-road car parking. 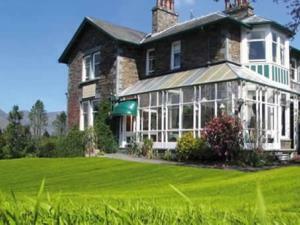 Rothay Garth has a superb position combining glorious mountain views with easy access to Windermere Lake and Ambleside. Ambleside village is one of the best known and visited due to its ideal location, a perfect base at the Heart of the Lake District. Rothay Garth at Ambleside is a beautiful traditional Victorian Lakeland slate building set in its own landscaped grounds. Whilst retaining its character and many original features, Rothay Garth offers en suite rooms all with tea and coffee making facilities, colour TV and radio and hairdryer, a comfortable spacious residents lounge, conservatory looking out to superb mountain scenery, elegant breakfast room and a large private car park. There is also free Wi-Fi available in the lunge area. Conservatory for residents use, locked cycle storage, tennis courts and bowling green nearby. Children welcome at any age only by prior arrangement and staying in a family/ Twin room with full paying adults. From M6 jct 36, follow A590/A591 for 19 miles to Ambleside. Continue on main road through Ambleside, at the bottom of Wansfell Road turn right, keep in right-hand lane, entrance to Rothay Garth car park in 50yds on the right. By train to Windermere station then either take a taxi direct to Rothay Garth or get 555 bus to Ambleside. At main bus stop go right down the hill onto Rothay Road, walk for 100 yards, Rothay Garth is on the left-hand side.